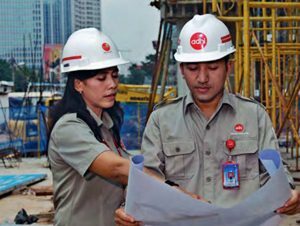 PT Adhi Karya (Persero) Tbk - Adhi Karya or referred to as "ADHI" is a reputable state-owned company in Indonesia, running business in general construction industry. Based in Jakarta. ADHI conducted its business activities rest on 5 business pillars; construction, energy, property, industry, and investment. ADHI is public-listed company and is majority owned by the Government of Indonesia. ADHI's shares are traded on the Indonesia Stock Exchange (IDX) under reference code "ADHI". At present, ADHI is 51% owned by the Government of Indonesia (51%) and 49% by public. ADHI now has 6 departments and 6 construction divisions. ADHI's departments comprise of Department of Infratructure I, Department of Infratructure II, Department of Building, Department of Light Rail Transit (LRT), Department of Transit Oriented Development (TOD) and Hotel, Department of Engineering, Procurement, and Construction (EPC). ADHI's construction divisions comprise of Construction Division I Medan, Construction Division II Palembang, Construction Division III Jakarta, Construction Division IV Surabaya, Construction Division V Balikpapan, Construction Division VI Makassar. In term of financial performance, ADHI succeeded in posting positive financial performance in 2017. According to information found in PT Adhi Karya (Persero) Tbk Annual Report 2017 as cited by JobsCDC.com, ADHI managed to record total revenues of Rp 15,156.17 bullion in 2017. This number is up 36.98% from Rp 11,063.94 billion in 2016. Total profit for period 2017 worth of Rp 517.06 billion or up 64.08% from Rp 315.10 billion in 2016. Total assets grew by 41.39% from the previous year, from Rp 20,037.69 billion in 2016 to Rp 28,332.94 billion in 2017.. Willing to be placed in all working areas of ADHI. S2 degree, majoring in Civil Engineering. Minimum GPA of 3.25 (scale 4.00). Maximum age of 24 years old (per 3 October 2018). Maximum age of 22 years old (per 3 October 2018). JobsCDC.com now available on android device. Download now on Google Play here. Please be aware of recruitment fraud. The entire stage of this selection process is free of charge. PT Adhi Karya (Persero) Tbk - D3, D4, S1, S2 Development Program ADHI October 2018 will never ask for fees or upfront payments for any purposes during the recruitment process such as transportation and accommodation.